He was the leader of the resistance movement against the Italian military occupation of Libya for more than twenty years. 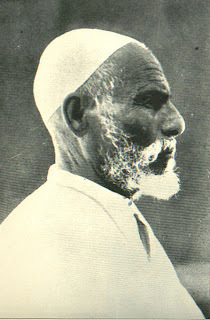 In 1912, following the Italian capture of Libya from the occupying Turks the previous year, Omar Mukhtar organized and devised strategies for the Libyan resistance against the Italian colonization. Mukhtar’s nearly twenty year struggle came to an end when he became wounded in battle and was subsequently captured by the Italian army. The Libyan hero was treated like a prize catch by the Italians. However, his resilience had an impact on his jailers, who later said they were overwhelmed by his steadfastness. His interrogators later confessed that Mukhtar looked them in the eye and read verses of peace from the Qur'an as he was tortured and interrogated. of course we're proud of him ...he's our beloved local hero and we'll never forget about him. 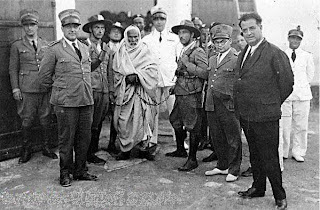 hi weda.. nice post even me i dont know that he was born there ..
Libya is Omar El-Mukhtar, to be proud of him is in our blood. THE LIBYANS WAR..WHEN IT'S UP???!! !